Do you know that GM Wesley So PHI (2665) is the only player among the World’s Top 10 Juniors without a coach ? 2. GM Sergey Karjakin RUS(2739) born Jan 12, 1990, decision to transfer to Russia from Ukraine is producing best results. His decision according to Sergey (as reported by chessvibes.com) is “mostly because of the coaches. And I also need to train with good coaches and there are a few good coaches in Russia, for example Yuri Dokhoian, who worked with Garry Kasparov and now in this tournament he is working with me”. Additionally, he said … “This decision was made because I didn’t have enough support inside the country, in Ukraine”. As of May 2010 FIDE rating list GM Karjakin had reached its peak ELO rating of 2739, and rose as the 2nd best among the world’s juniors and now ranked 3rd best player of Russia and also 14th best in the world. Currently, he is now being trained by GM Alexander Motylev, the coach of the Russian national team. 3. GM Maxime Vachier-Lagrave FRA(2710) born Oct 21, 1990 and the reigning World Junior Chess Champion do have coaches too ! In his interview at chessdom.com he said … “I also have some trainers who I see during tournaments and some training sessions with Arnaud Hauchard and Pavel Tregubov”. 4. GM Ian Nepomniachtchi RUS(2695) born on July 14th, 1990 and as of May 2010 FIDE ratings is the Top Junior candidate to 2700+ ELO zone or the hyper-GM status. He only needs +5 ELO to attain that status. He was the 11th European Individual Men Chess Champion held in Rijeka on 5-19 March 2010. He is a textbook example of a talent cultivated and produced by the world famous Russian chess school. Been in the hands of one of Russia’s most reputable coaches (and trainer of Russia’s national junior team) GM Sergey Janovsky. 5. GM Le, Quang Liem VIE(2687) born on Mar 13, 1991 is a product of an ambitious Vietnam government chess program & investment hiring foreign coaches (Russians & Ukranians) to train the National Chess Team. 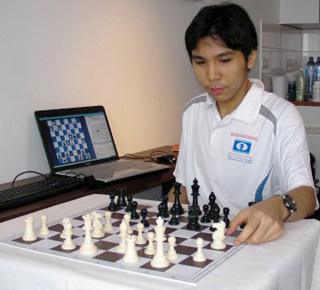 Le was the 1st Asian chess player to win the Moscow Aeroflot (2010), the toughest open tournament in the world. The victory and a 3rd place in the earlier Moscow Open put him where he is now. After the victory @ Aeroflot, Le told Thanh Nien newspaper that he would stay in Russia for one month to consult Russian coach GM Alexander Khalifman, a former 1999 FIDE champion. Le also attributed his two Major accomplishment this year were due to his collaboration with GM Evgeny Bareev a year ago and this is what he said … “I believe that my good results arrived mostly thanks to him. Evgeny did a lot to help me to progress, he can identify weaknesses in my game and help me make steps for the overall improvement”. 6. GM Fabiano Caruana ITA(2675) born Jul 30, 1992, is the first player ever to win both Corus C (2008) and Corus B (2009) in consecutive years placing clear first in both. His trainers were National Master Bruce Pandolfini and GM Miron Sher. He also trained with GM Pal Benko, when Pal was spending summers in New Jersey, and via the Internet with GM Gregory Kaidanov. GM Alexander Chernin HUN is his current trainer. 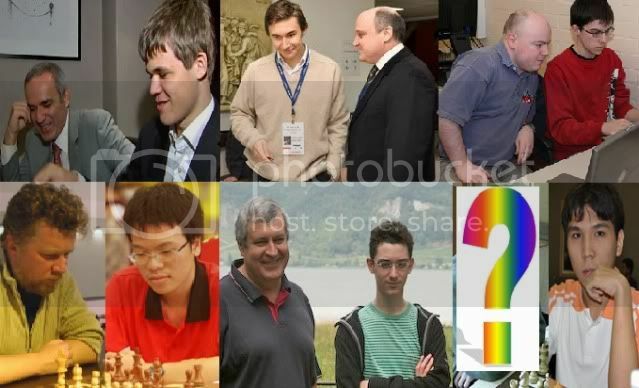 Wesley recent interview @ The Chess World Cup 2009 to the question … Do you have a personal coach? His answer was … “Unfortunately I don’t. But I think that the moment is coming: I will need it soon”. 8. GM Dmitry Andreikin RUS (2643) born Feb 5, 1990, is a Russian Junior Chess Champion. He is another example of a young talent cultivated and produced by the world famous Russian chess school. Also been in the hands of Russia’s national junior team coach GM Sergey Janovsky. 9. GM Anish Giri NED (2642) born June 28, 1994. At 15 is the youngest player ever to win the Dutch Championship (Sep 2009). He also won the 2010 Corus “B” Tournamament in Wijk aan Zee. Who said he don’t have a coach? In his interview after winning the Dutch Championship with chessvibes.com he said … “I have already had a short training session with Vladimir Chuchelov (trainer of the Dutch Chess Federation) in July, and I think we will continue working on chess. Daniel Fridman also helped me and I had a contact with him during the championship. I think those cooperations helped me in this tournament and I hope they will help me in the future as well”. 10. GM Nguyen, Ngoc Truong Son VIE (2642) born in Feb 23, 1990 is another top Vietnamese Chess player. Also a recipient of his government & private sponsorship, he trained under coach Hoang Minh Chuong in Hungary. If these World’s 9 top young players and their respective countries had recognized the value to train with good (world class) coaches/trainers and they had attributed as well their achievements & progress in the ranking chart on their collaboration to their coaches … It is also but proper and a must that GM WESLEY SO be also provided with a good & worldclass Coach/Trainer! As to what level of success we expect of him to progress soonest … will also largely be dependent on the level of coach/trainer this country could provide him!